Minister Pyne at Teledyne Defence Australia. Image via Twitter. 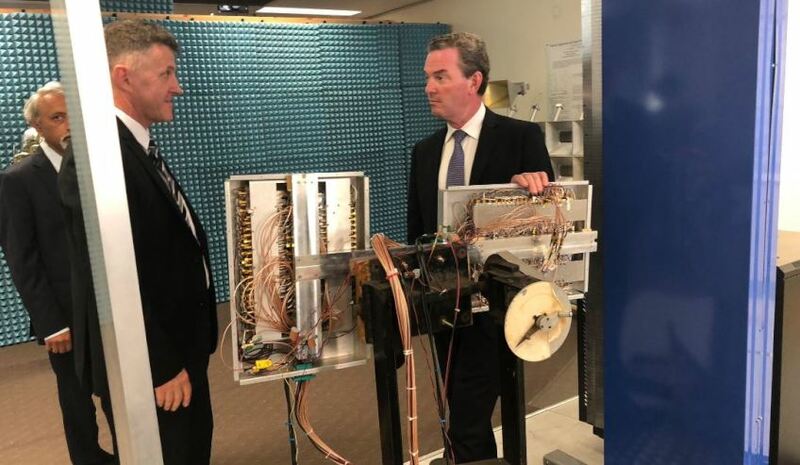 Defence Industry Minister Christopher Pyne has unveiled the latest group of Defence Innovation Hub contracts, totalling $13.4 million. Daronmont Technologies in Victoria scored the largest contract since the launch of the Defence Innovation Hub, landing a $7.9 million project that will look to build a prototype radar capability that could be used to replace existing technology used by Defence that is approaching end of life. Queensland's Teledyne Defence Australia scored a $3.4 million contract to develop a vehicle-mounted improvised explosive device detection and clearance capability that uses an advanced radar system that could be integrated with existing ADF deployable vehicles. In NSW, Sonartech Atlas landed a $1.3 million contract to investigate the potential of improving sonar performance and classification of underwater acoustic signals, while Jenkins Engineering Defence Systems scored a $276,000 contract to explore a cost-effective microwave-band radar electronic support system to provide automated warnings and recording capability of potential threat signals without the need for a dedicated expert operator. Meanwhile, Quintessence Labs in ACT has received its second Innovation Hub contract, valued at $528,000, for a project that aims to develop a resilient encryption method that could protect sensitive data on mobile assets in uncontrolled or hostile environments through virtual zeroisation technology. In July last year, Quintessence received a $3.26 million contract to explore the feasibility of the establishment of highly secure communications links between two points, both fixed and over line of sight free space. Minister Pyne said the latest contracts will ensure Defence has access to leading-edge technology. "It will also help support a number of local jobs across Australia and continue to keep our defence industry engaged in developing the latest technologies for Australia’s defence," he said.